A huge mass of small volcanic rocks (pumice) was spotted in the South Pacific ocean (north of Auckland, New Zealand) on August 9, 2012 by a New Zealand air force plane. Royal Australian Navy officer, Lieutenant Tim Oscar onboard navy ship heading to the Kermadec Islands, described it as "the weirdest thing I've seen in 18 years at sea." "The lookout reported a shadow on the ocean ahead of us so I ordered the ship's spotlight to be trained on the area. As far ahead as I could observe was a raft of pumice moving up and down with the swell. The rock looked to be sitting two feet above the surface of the waves, and lit up a brilliant white colour in the spotlight. It looked exactly like the edge of an ice shelf. I knew the pumice was lightweight and posed no danger to the ship. None the less it was quite daunting to be moving toward it at 14 knots. It took about 3 - 4 minutes to travel through the raft of pumice and as predicted there was no damage. As we moved through the raft of pumice we used the spotlights to try and find the edge - but it extended as far as we could see," said Lieutenant Oscar. Pumice is made from lava and water and is very lightweight, so it poses no danger to ships. 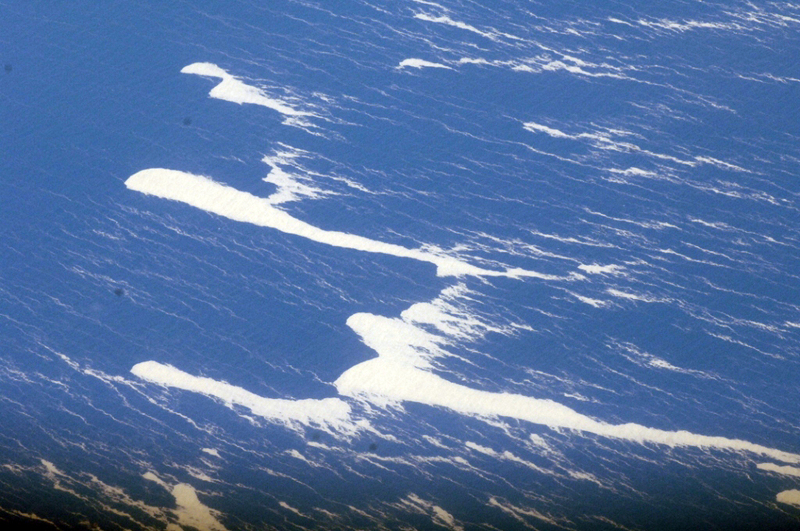 Pieces of pumice are floating more than 1000 kilometres offshore. GNS volcanologist Craig Miller said the pumice raft was about "half way to Tonga", and just past Raoul Island. Scientists don't believe the eruption is connected to White Islands volcano or to the onshore ash eruption of Mount Tongariro but rather that it's from another New Zealand's erupting volcano – the undersea mount Monowai. In the past week both Mount Tongariro and White Island have erupted. The samples of newly found pumice will be analysed to determine which volcano they came from. Monowai is a volcanic seamount to the north of New Zealand (25.887°S 177.188°W.). 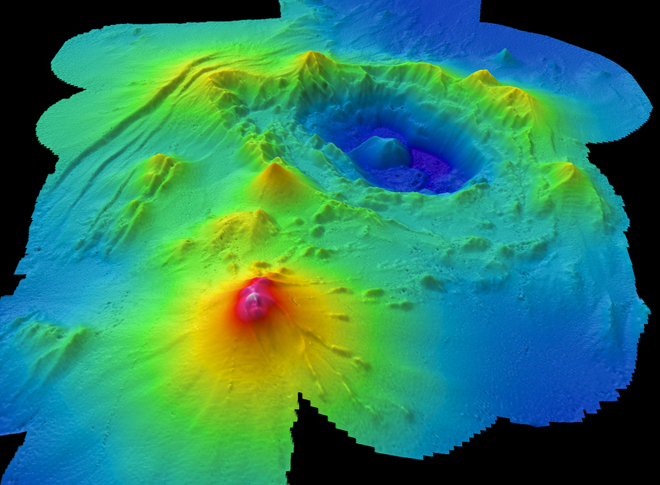 It is one of the most active volcanoes in the Kermadec volcanic arc and has erupted many times since 1977. The summit is approximately 132 metres (433 ft) below sea level, considerably above the level of the nearby Tonga and Kermadec Trenches. The summit's position and depth changed between 1998 and 2004, due to a landslide and eruptive regrowth. 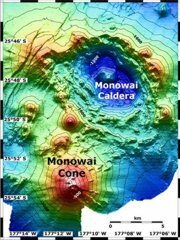 A 1500 metre deep caldera, 13 by 8 km, lies 5–15 km NNE of the seamount's main cone. The crew aboard the research vessel Sonne, set out on a cruise last spring, ended up witnessing one of the fastest episodes of volcano growth ever documented on Earth. The Monowai erupted during the expedition and added about 300 million cubic feet (9 million cubic meters) of rock to its summit in just five days. "A lot of luck was attached to this find," said Anthony Watts, a geologist at the University of Oxford who led the study. Watts and his collaborators were able to carefully map the volcano to find what the changes at Monowai have been during these eruptive periods and it boils down to something we find familiar for terrestrial volcanoes: collapse and healing, sometimes quite rapidly. Over the course of 14 days of mapping, the team found that the seafloor depth changed, first dropping almost 19 meters, then surging back almost 72 meters. That is quite a dramatic shift for only 2 weeks. This activity coincided with earthquake activity at Monowai. There are 12 active volcanic areas in New Zealand. New Zealand needs to be prepared for a range of styles of volcanic eruptions. It may be a new island emerging there, lets wait a while and see.